From Street Car to Rally Racer to Rock Crawler. Scuffy II started out as an ordinary little Jeep Cherokee. When I was ready to build my rally racer, I wanted a two door Cherokee with a five speed transmission, six cylinder engine and 4 wheel drive. An Ebay search turned up almost what I wanted. There were only two problems. 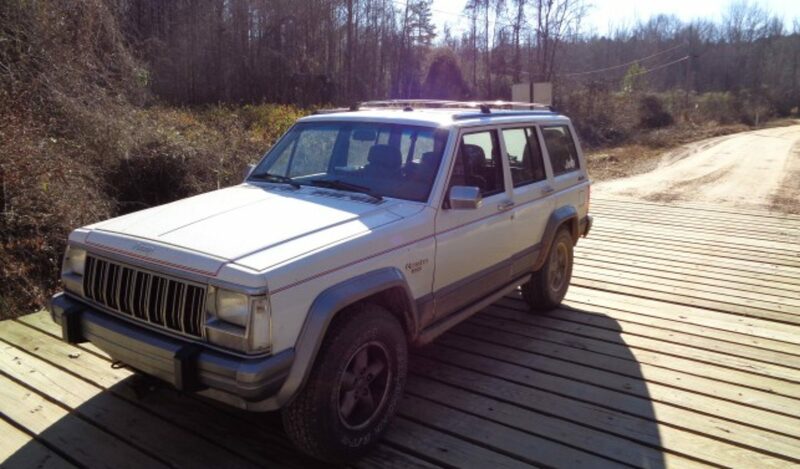 The Jeep was an 88 with the Renix engine controller and it was in Pennsylvania. However, the price was right so I made a deal, hooked up the trailer and headed north. My dad and my son went along for support. We arrived early in the morning to pick up the Jeep. We were expecting to have some fun loading it because the owner said the clutch would not disengage. This was one reason it was being sold cheap. I noticed that even though it was very cold out side, the little Jeep started up very easily. I had my dad drive the trailer down the street a bit and drop the ramps. I put the Jeep in low range and hit the key. Sure enough it lurched forward and started up just fine. I had just enough room to line it up with the ramps and drive smoothly onto the trailer. I cut the key and the Jeep stopped at just the right spot on the trailer. I even raced it in one autocross. It really looked funny on autocross tires. It drove even worse. The trouble was everything about the engine and body had to be completely OEM stock. This was tough and expensive on an old Jeep. There were many simple mods that I could have made that would have been cheaper than the stock parts, however, they were not allowed. Turbo cars were allowed external engine computers that upped their power output greatly. This put the Jeep at a horsepower disadvantage to the Subarus. More Ebay searching turned up approved racing seats and harnesses. I traded for a roll cage and borrowed a computer and driver’s suit. RallyJeep was born. A quick coat of racing white paint and a set of SCCA decals and we were ready for our fist race. Between rally races, I began enjoying the sport of off road driving. I built a cheap jeep to see how much I would enjoy the sport. Just as I was beginning to see that off road driving was huge fun and I was meeting lots of interesting people off road, the sport of rally racing took an unexpected turn. SCCA dropped their rally series and my favorite race – Cherokee Trails – was canceled forever. An assessment of my situation showed me I had a very nice and expensive Jeep that was pretty much useless to me. I had a cobbled together collection of parts that was lots of fun to drive and a great support group that was fun to meet with. I decided to make the commitment and convert my RallyJeep into Scuffy II the off road Jeep. This would put my lockers and 4.7 L Stroker engine to good use. And I would not have to deal with a weak carbureted engine and slipping transmission on my off road trips. First I mounted the ARB equipped D30 front axle in place. Knowing I would add lift later, I modified the area above the control arm mounts for extra droop. Next I installed the ARB compressor. I also installed a lock rite equipped 8.25 in the rear that had been living under my Daily driver Jeep. I did make a couple more rallycrosses before adding the lift. The lockers really helped in the mud on rainy days. I finally made the ultimate commitment and pulled the lift kit off Scuffy and put it on Scuffy II. My first off road trip was to Beasly knob running the 30“ tires form my daily driver. The lockers made a big difference but the small tires were just too limiting in the rocks. Next came fender trimming and the 35” tires. The front was easy. I just traded fenders between the race Jeep and Scuffy’s already trimmed fenders. At this point I could still go back to rally racing with about four hours work. However, the rear tires simply would not work without more clearance than the stock wheel well provided. It took a bit of soul searching, but I finally made the commitment to irreversibly modify the rear wheel arches. Actually, I can probably still cover the mods with the stock flares and race it again if I ever choose to. My first real off road adventure with the new set up was to Harlan, Ky. I was really happy with the extra control that the manual transmission gave me. Especially when going downhill. I also got to test the new winch pretty well as we used it to pull a Dodge Ram pickup up a very step muddy hill. The most recent modification to Scuffy II has been to make the doors removable. Having the doors off greatly improves visibility and add to the open air feeling. The two door doors are also very heavy so there is a noticeable performance improvement with the doors off. This Jeep gets way more use now than it ever would have as a rally racer. Driving off road has taught me many lessons about life and helped me build many great relationships. Also, I find the thrill of conquering obstacles off road gives me every bit as big of an adrenalin rush as racing through the woods at speed. I feel really safe with the rally spec roll cage protecting me off road. Knowing the cage was designed for a seventy mile per hour impact give me a lot of confidence at fifteen MPH trial speeds. Overall, this Jeep has given me a lot of fun and adventure. I expect to have many more fun adventures as I learn to drive the Jeep and keep reinforcing the weak spots. Any pics or videos of the rear wheel tub mods? I’d like to get something larger than the 32″s I have on mine now but of course the rear well is still limiting my options. The wheel tubs are stock. I have had 35s in there and I am currently running 33s. The whell arch needs a little work bu thte tubs clear fine.